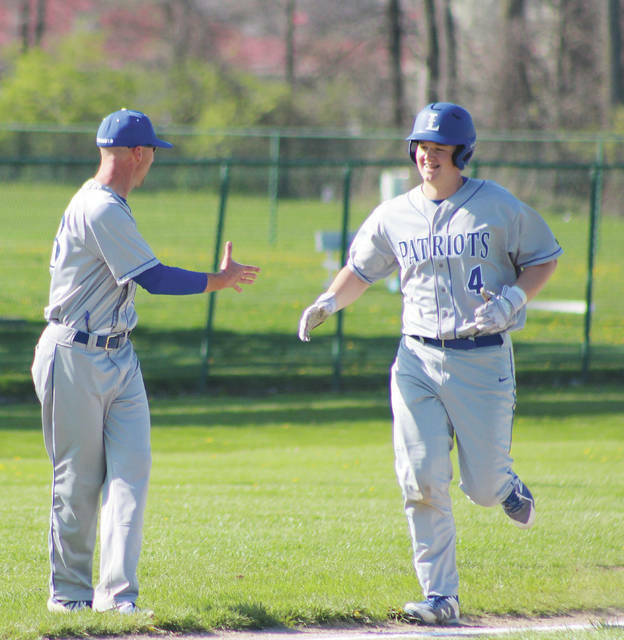 Liberty’s Justin Nelson is congratulated by head coach Ty Brenning after connecting on a two-run homer in the second inning of Monday’s OCC showdown against host Westerville North. Junior Justin Nelson and sophomore Brennan Rowe combined to drive in nine runs to lead the Olentangy Liberty baseball team to a convincing 14-2 win in five innings at Westerville North Monday. Liberty clinches at least a share of the OCC-Buckeye championship with the win and can win it outright with a win over Westerville Central at home Wednesday or at Olentangy Friday. An Olentangy loss would also do the trick. It’s the seventh title in school history for the Patriots (21-3, 12-1) and the fourth in the last five seasons. Nelson homered and doubled twice, drove in four runs and scored twice in his three plate appearances only to be topped by (in run-production) Rowe, who hit a grand slam and RBI double. He also walked and scored two runs. Nelson hit a two-run homer in the second before adding RBI doubles in the third and fourth innings. “I went down in the count (1-2) when I hit it out,” Nelson said of his homer. “We’ve been working on our two-strike approach, just looking at off-speed, and I think that really helped me because he had a slow curveball. Rowe drove in Liberty’s second run on a double in the first before crushing a grand slam over the wall in center in the fourth. He added a single in the fifth to complete his perfect day at the plate. Rowe also pitched a couple of innings in relief of Mitch Milheim, who allowed two hits, a walk and a hit-batter and struck out five over three scoreless innings to pick up the win. Liberty’s thrived in a trying season weather-wise. Nelson attributed the solid season to his team’s work ethic. Corey Mayer and Mitchell Okuley each scored twice to go with a hit, a walk and a RBI for the Patriots. Auri Dover had two hits and Chad Gordish and Mason Lowder each had RBI hits to lead North (6-16, 2-10). Andrew Miller took the loss, allowing seven runs over 2.1 innings.